For distances of up to 250 miles, our CNG Virtual Pipeline® is the best alternative to costly underground conduits for transporting natural gas to remote locations. At the heart of the Virtual Pipeline® is the MAT™, a modular transport and storage unit used to bring CNG to remote locations where traditional pipelines are unavailable or too expensive to install. Each MAT contains thirty-nine forty-gallon cylinders, allowing for 1,560 total gallons per unit (420 gasoline gallon equivalents). Dimensions 127" x 100" x 90"
The MAT-B™ works in conjunction with regular MATs to provide mobile fueling capability for the Virtual Pipeline. Together, they serve as a mobile CNG station with a recompression booster that is operated by a hydraulic power unit (most often a 20 KW Caterpillar power generator). This keeps the MAT-B storage system at a steady pressure of 3,600 psi. MAT-B’s integrated dispenser allows you to fuel vehicles on the go, which is what allows you to fuel on the go. MAT-B’s electronic management system controls compression, filling and delivery with real-time precision measurement and monitoring features. This enables accurate fuel billing and reporting for your customers. The system is capable of adapting to the demand of each daughter station through the connection between the MATs and the Pressure Regulating Stations PRP™ that supply natural gas at the output pressure and flow range required by final consumers. This truck carries one MAT-B and two MATs. The configuration offers 143,000 SCF at 3,600psi or 1,150 GGE. Why choose a Virtual Pipeline? 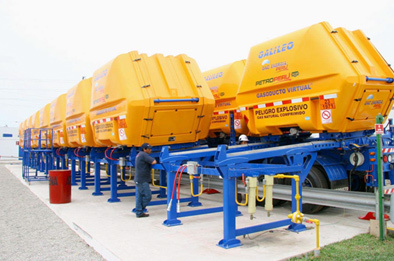 Verdek’s Virtual Pipeline system serves every stage of the mobile CNG transportation process. It offers a cleaner and more economical alternative for industrial facilities and power companies located far from natural gas pipelines. 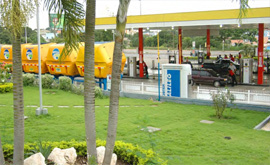 The innovative MAT system makes bringing CNG to and from your sites a breeze. 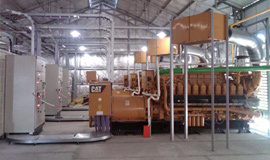 Furthermore, the remote CNG Station and PAC Platforms make loading and unloading these modules effortless. Integrate these with the MAT-B’s booster and dispenser management system and you’ll always be ready to hit the road. 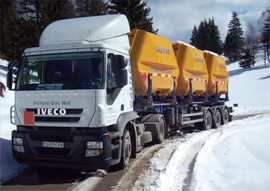 Verdek also offers a Virtual Pipeline for LNG transportation. 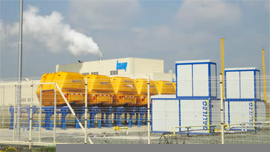 This pipeline solution features a sophisticated refrigeration system that ensures LNG will not gasify in transit. This LNG tank can be placed onto a flatbed truck and house 37 m3 of gas, or 16.7 metric tons (897 MMbtus). Call us today for a consultation and quote and let us set up a Virtual Pipeline for your business.